Arthur Machen was born in Caerleon in a house just opposite the Old Bull Inn. His house is next door to the Priory Hotel from the back he would have seen the great amphitheatre at Caerleon. I’ve walked past his house many times on my way to the Hanbury where another literary giant Tennyson whiled away many a pleasant hour scratching out poems on the back of a beer map – and where there is a window where you can also pass the time over a nice pint. I must also confess to a spent too much time in the Old Bull where from a window you can see directly towards his house. The landscape around Caerleon, the old Roman ruins and its long mediaeval history had a profound impact on him – and appears in many of his works. He was born on 3 March 1863 so this year is 150th anniversary of his birth which will be celebrated by the Caerleon Arts Society (see link below). 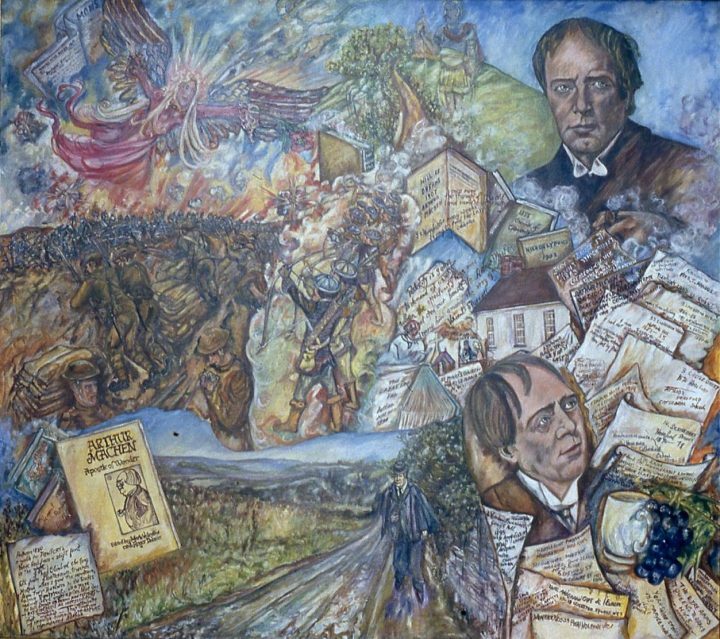 I painted this picture many years ago and tried to include many of the aspects of this complex and fascinating man.